Join me for an excursion into the woods where we'll find and collect late fall/winter plants that dye. Late Goldenrods for yellows, Sumac berries for roses and Black Walnuts for gorgeous, classic browns. SATURDAY: NOON - 5 pm...We'll meet at YaloRUN Textiles and then go out to my tried and true hot spots in the woods to collect the material. Then we'll go back to the YaloRUN house studio kitchen at 137 Blount Street. Here we'll prep the material, make the baths, and dye the material. We will then let them soak over night. SUNDAY: Meet at YaloRUN studio house (137 Blount Street) at 10 am to pull the yarns and fabric and have brunch, mimosas and bloody marys! Join us in the beauty and surprise that is natural dyeing! $85 for the two day workshop with all materials included. You will leave with your dyed material, several large mason jars of the natural dye you made from the 3 different plants, and all supplies and knowledge to continue your natural dyeing experiments at home. Wear boots, bring gloves, and you kinda need to be physically able to tromp around the woods a bit. Sign up HERE. Difference between a lobster mushroom dye on cotton ( light pink) and wool (dark pink). Learn about the beauty, versatility and how-to of the vintage Rail Fence quilt. This workshop, taught by master quilter Cathy Fussell of Swift Mills Studios in Columbus, Ga, will lead you in a step-by-step guided 2 day workshop in which you will learn all it takes to make this classic quilt. The versatility of this geometric pattern allows for your own design preferences to really shine while still staying within the fascinating and rich realm of pattern quilting. Day 1 of the workshop is Sunday January 10 and will cover history, design and practicalities of piecing. You will leave this day with all the materials, tools, and knowledge needed to continue piecing your quilt top at home ( or in the yaloRUN studio!) over the course of the next two weeks. Day 2 of the workshop is Sunday January 24th from 10 am - 5pm. This day will focus on taking your pieced top and basting it to the backing and learning to hand quilt. You will leave this day with all the materials, tools, and knowledge needed to continue and complete your quilt at home. This workshop will teach pattern history, machine piecing, basting, backing, hand quilting, and binding. You need to know none of that before you walk in. No machine skills necessary. You'll learn. Cathy Fussell is a much-loved teacher and an internationally award-winning quilter whose specific mastery is hand quilting, arguably the most distinguished of the quilting skills. But really she's a master at all of them. Of quilting she says, "Quilts are about history and art and politics and stories and patience and beauty and community and economics and place and expression and freedom and transition and family and warmth – and love. And they’re feminized and devalued. All that is why I’m so into quilts and quiltmaking." Boom. Workshop fee includes all materials (except a hoop which can be purchased in store) and full studio access all month during open hours. Sign up HERE! Just what it says. Your child will make a quilt of her or his very own design from start to finish. They will learn every step of the process....from designing to cutting shapes and piecing ( on the machine!! ), to basting the layers together, to hand quilting ( not on the machine!! ), to binding off the edge and attaching a hanging sleeve so that you can display the quilt on your wall. You can't learn to quilt without learning the history behind it so they will be exposed to techniques old and new. The finished piece will be a craft sized quilt but the general technique can be applied to any sized quilt and they'll have the skills they need to continue on their own. Can you imagine your 8 year old making an entire quilt from start to finish?! I can. This workshop is open to 3rd graders through highschool. Workshop is every Tuesday in January from 3:15 ( or 3:30 if coming from Oxford) to 5:00/5:30 pm. Cost is $150, all materials included. This is a real deal workshop, we're gonna make something good & beautiful. Sign them up HERE. Both quilts pictured from Gee's Bend, AL. The YaloRUN Kids' Crochet Club!! It's a KIDS' CROCHET CLUB! Every Wednesday from 3:30 - 5:00pm at YaloRUN we'll be making things all hook and yarn. This weekly workshop is for boys and girls in elementary thru highschool. Workshop is $30 for a month. Crochet is a skill that is versatile, inexpensive, and works up quickly for fast and satisfying results. Perfect for kids. But warning: Crochet is a gateway craft...leads to knitting. Give your child the gift of a forever skill...sign em up for YaloRUN Kids Crochet Club HERE. As always, YaloRUN offers a 10% sibling discount. If you grew up like me with a Christmas tree covered in fried eggs, crawfish, pepperoni pizzas, a glittery alligator, a pig with an odd metallic sheen, two Ringo Starrs, unintentionally horrifying teddy bears that might have been bulldogs but you weren't really sure, and several Santa Clauses that all looked to be in a state of semi-homelessness then, yes, you made salt dough ornaments. Salt dough ornament time was a true joy of childhood and we're bringing it back at YaloRUN. Drop your kid(s) off at YaloRUN from 9am - 12pm on Monday November 23 - Wednesday November 25 and we'll take care of the rest. The workshop will involve following a recipe and learning basic shaping skills in modelling material ( i.e. how to put smaller pieces together to make the larger piece you want...or, how not to make your ornament so fat that it explodes in my oven.) We'll bake and paint the ornaments and on the last day at pick-up time we'll have the ornaments on a little Christmas tree in the shop with some cookies and punch and 1970s Christmas records playing to make it truly festive. No salt dough tree is complete without a hotdog. Happy hotdog christmas! Salt dough workshop is $50 for the three days with all materials included. Sign up HERE. We will go to the YaloRUN house on Blount Street for the first day of workshop to use the studio kitchen. We offer a 10% sibling discount. Class size limited so jump in! Berets...perfect for 5 & Dime shopping, riding on the back of a bike, and not wearing much more. As always, the cost of the class is $30 for the entire month of Tuesdays. This month it also pays for your pattern and some really good Quince & Co yarn. YES. Beginners welcome and encouraged and if you don't want to make a beret then we have the various fingerless glove & beanie patterns from September & October available. 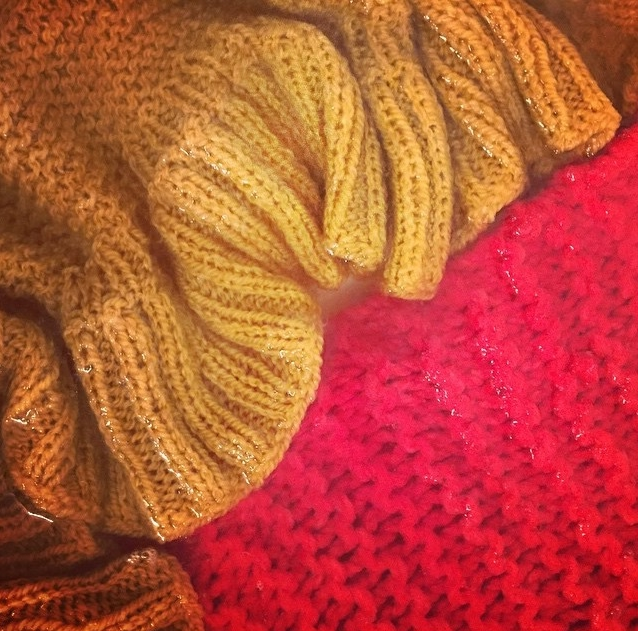 Tuesday Knit Club: October, Madonna. As always, Knit Club membership is $30 for the month. It includes 2 hours of fun and direction on Tuesdays and studio access all month long. You get the pattern and I throw in your first set of needles for free. We have wine and beer and get funny. Beginners are welcomed and encouraged and are free to start with old patterns that the Knit Clubbers have already covered ( i.e. the classic ribbed beanie from September, pictured below on Bill.) There's no playing catch-up. Just come and start. I'll show you how. Relax, enjoy and go at you're own pace. All materials needed are in-store. See ya there! SKILL WEEK: KNIT 2015 is YaloRUN Textiles' inaugural week in a series of 'Skill Weeks' interspersed throughout the year. Each week will be a full 7 days of workshops and demonstrations fully devoted to one major craft at a time. October 5 - 11th is KNIT, with smaller evening demo-style workshops Monday - Thursday and then ending with a big, project-based workshop on Saturday and Sunday. We are thrilled to have this year's KNIT WEEK teacher be Katrina Perdue of Memphis, whose intuitive approach to knitting is right up our alley. All weekday afternoon demo/workshops are taught by Coulter and are 5:30 - 7:30pm, $10 at the door. If you sign up for the large weekend workshop taught by Katrina Perdue then all weekday workshops are included for free! Come watch and learn how to actually start a project...how to get that first row of stitches onto the needle (cast-on) & then how to make your 2 main stitches, knit and purl. You can just watch Coulter and/or use in-studio supplies to try it yourself. No pressure to make it look good, no project to finish. Just get the hang of it. These three steps are essential to any project and once you know them, the sky's the limit. Learn how to take the basic stitches & put them in order to create pretty & functional patterns in your knitted pieces. I'll have a bunch of samples knitted up that you can try on. Everything from basic ribbing to basketweave to herringbone to cables. Get in there & mess around with it. You know how sometimes you see someone knitting with what looks like 50 needles at once? That's dpns ( double-pointed needles.) And it's not really 50 needles, it's just a few & it's used to knit small things & you can totally do it! We'll also try out circular needles (pictured left beside beautiful margarita) which are used to knit bigger things! You can also totally do that! Big n' lil Wednesday. Knitting stripes! Knitting blocks! That's it. That's right -- I said pass your knitting to the person beside you. You’ll get it back. Promise. In this workshop, we are going to fully embrace our creativity and love for the art of knitting. New stitch patterns will be explored, skills will be shared, and ideas will get tossed into the scrambled pile of yarn and needles that we will make in front of us. We will collaborate to make some crazy fun pieces, and hopefully leave with a completed, one-of-a-kind scarf just in time for cooler weather. If you don’t like scarves, make a pillow. Or a yarn bombed planter. Or a scrumbled freeform wall hanging. Or start a cozy blanket for finishing later. Whatever your yarn lovin heart feels like making is just fine here. Basic knitting knowledge is a strong plus, but not essential for this workshop. If you also like to crochet, bring your hooks and let’s really mix it up! Plan to bring at least a few skeins of yarn to work with or share with the group. This is a great opportunity to dig through your stash and pull out yarn that you have always loved but have never used. Some yarn will be provided, but the more randomness we can create through sharing, the better. Some needles and notions will be provided, but feel free to bring your favorite tools to work with or lend to the group. Come have some fun and let’s make a beautiful mess together! Weekend Workshop fee is $75 and includes all weekdays demo programming of KNIT WEEK. Weekend workshop is 10 am - 4 pm Saturday, October 10 with the last couple hours focused on starting an actual project. An optional few hours is included on Sunday for those wanting to continue with a more relaxed knit-in help session. Kids' Week #1: Hold-My-Stuff Tote! Join us after school from 3:15 - 4:45, Monday Sept 28 - Thursday Oct 1st for a kid's dye/embroider/sew class inspired by the Hold-My-Stuff Bag from the wonderful kids' craft book Sewing School by my good friend, Andria Lisle and her co-author, Amie Plumley. MONDAY! We will dye our muslin fabric in the little kid-safe YaloRun dye kitchen. We will choose from blueberries, strawberries, muscadines, or whatever else we can think of! TUESDAY! We will embroider a little design on our hand-dyed muslin! You will draw a beautiful little design ( flowers? self-portrait? your dog? your name?) and sew it onto your fabric so that it will show on the outside of your bag. THURSDAY! We will sew our bags together and be proud to show our sewing skills to the world with our new stuff-tote. This class is for elementary through junior high. Fee is $70 for the week. All materials included. Your child will learn hand-dyeing with natural material, embroidering, pattern cutting and hand sewing. Class size limited so sign up HERE! because today's the day the teddy bears have their picnic." -- Teddy Bear Picnic, creepeist song ever written. DAY ONE: 1:00 pm...Join Coulter on one of her weekend day-trips out to the fields, woods & lakes looking for plants & berries for fabric dyeing. We'll pile in the van, head out, probably trespass, & see what we can find....early black walnuts if we're lucky, sumac for sure, some goldenrod maybe, muscadines....who knows. We'll see. Then we go back to the YaloRUN Studio House kitchen on Blount Street and prep our fabrics, make our dye baths, and dye our fabrics. This part will be happening in the late afternoon so there will be kitchen wine & porch cocktails. Bear dyed in sumac berries next to a future bear dyed in muscadine. DAY TWO: 10:00 am...Meet at YaloRUN Studio House on Blount Street to pull the fabrics from the baths. Best part!!! We'll heat set them & go to YaloRUN Textiles where we will use our newly hand dyed material to make cute lil teddy bears! From woods to studio to woods again. Full circle. Kids love these bears, make great gifts. 2 day workshop + all materials ( dye mordants, whatever we find in the woods, muslin, thread, polyfill) + access to the studio all week if you need extra sewing time + cocktails = $70. Class size limited to 5 because that's how many people can fit in my van. * day one you'll need to wear boots and bring garden gloves. ** If it rains we'll get wet but if it rains real bad then we'll forage my freezer & the Piggly Wiggly. My classic knit hat...check it. Show up to YaloRUN the 2nd & 4th Tuesday of every month from 5:30 - 7:30pm to knit some stuff. This is a monthly project-based class for Beginners with a capital B, where you'll learn to knit by working the classics. We'll start with my personal fav, variations on the WWII Watchman's Cap. Millions were made by millions of women in WWII and if they can do it, you can do it, so says Rosie the Riveter. It has an official pattern, but there are really many variations of this hat and we'll go with whichever one you like and I'll help you adjust the pattern. This hat can be made with 2 kinds of stitches and 2 straight needles or worked in pattern or cables with circular needles and/or double-pointed needles. 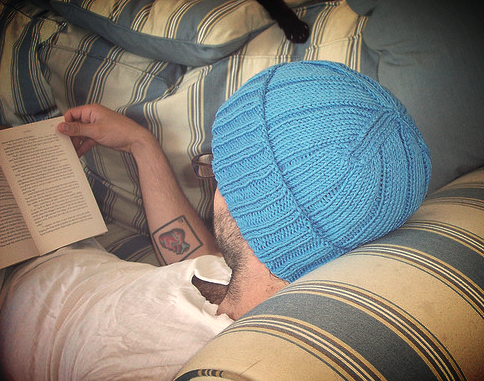 A great project for beginners because this hat only gets as complicated as you let it. It's just your basic beanie, worn by only the coolest of male movie stars. And that random smokin' hot WWII guy up there. Knit Club is $30 at the door. This pays for both sessions that month. Deal! There will be beer. Deal Deal! *Knit Club participants can come in to the shop anytime during the month to get a little advice/help with that month's project if you're stuck. North Alabama Hillside, 2014, Cathy Fussell. Her signature "relaxed tumbler" pattern. Join us for yaloRUN's introductory quilt workshop lead by master quilter CATHY FUSSELL. How to piece a quilt without using a pattern. Learn how to stray from the straight and narrow but still come out okay. Workshop takes place 2 Saturdays in a row at YaloRUN, August 15th and August 22nd from 10:00 - 5:00pm* ( with an noon lunchbreak... BTC Grocery time with Chef Dixie!) You will make a machine pieced, hand-quilted quilt! You really will! -- All materials and supplies** for a quilt measuring 48" x 72"
-- Anytime access all week long to YaloRUN's studio and machines. Stop in anytime during store hours for a quiet place to work. Our studio is your studio from Saturday to Saturday. -- Access to master quilter/teacher Cathy Fussell who will be in-store all day on Wednesday for personal coaching or general reassurance if you get hung-up on a step. Or make a time-specific appointment with Cathy Fussell at any time during the week. Access to daughter-of-master-quilter, Coulter Fussell, for this same thing anytime all week long. -- access to Cathy's extensive library of quilting books for color inspiration. Enjoy a quilting experience that's more intuitive and less template-bound. Class is also appropriate for all levels. Only 8 spots available! Sign up/purchase on our SHOP page. * If you can't stay the entire day then no worries. We all have obligations. Don't miss this class just because you have to take your kid to the ball field at 3pm on Saturday. You'll have studio access all week. **Quilting hoops will be available for purchase or you can use studio hoops in-store. Mary Lee Bendolph, Work-clothes Quilt, 2002, denim and cotton, 97 x 88 inches. Join master quilter CATHY FUSSELL for an evening of quilt immersion. If you want to know more about those quilts you inherited or you’ve thought about collecting quilts but you need some direction or you’ve considered learning to quilt but don’t know where to begin or you simply love quilts and want to spend more time with them or if you like hanging out and drinking wine with people on a Friday night, then this lecture is for you. Cathy will show images of famous quilts and of quilts representative of various quilting traditions. She’ll exhibit some of her own quilts as well as quilts made by others. She’ll discuss quilt trends, both past and present. You'll leave with knowledge gained, good times had, and a belly full of pimento cheese.